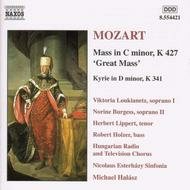 Mozart: Mass No. 18 in C Minor K. 427 'Great' / Kyrie in D Minor K. 341 by Various. By Wolfgang Amadeus Mozart (1756-1791). Naxos Classics. Choral. Listening CD. Published by Naxos (NX.8554421).Release date: 10/1/00.About Listening CDsListening CDs are traditional music recordings. Listening CDs make a great educational supplement - hear exceptional professionals play the music you're learning! Or, just enjoy listening to the music you love.